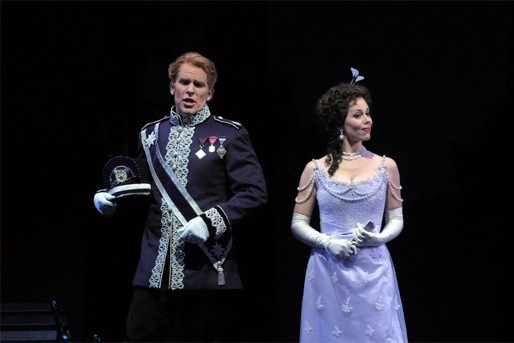 Roger Honeywell and Elizabeth Futral in The Merry Widow. Photo by Dan Rest. Last night I attended the opera for the first time in a long time (I saw Lakmé at the Seattle Opera around 2000). While I love a pretty voice and great big stage design, I’m no expert on the subject and so can’t get into the nuances of any role interpretations or directorial decisions in the new production at the Lyric directed by Chicago Shakes’ Gary Griffin. I can say it’s a rollicking good time, three breezy acts of mistaken identity, infidelity and desperation set in Paris a hundred years ago. I went mostly to see new choreography by Daniel Pelzig, the former resident dancemaker at Boston Ballet I told you a month ago needed a man. There’s not a lot to talk about, although what is there is in no way offensive or boring. Act Two opens with a czárdás-ish romp in the titular widow’s garden pretty much like what you’d catch in any old Coppélia. It’s interesting to see some mainstays of the dance scene in a non-dance-oriented production; the cast features current and former Hubbard Street, Seldoms, Hedwig, DanceWorks and River North performers and, thus, what little they’re doing is at least executed well. Act Three, set at Monmartresque club Maxim’s, also opens with a dance, a cancan for six grisettes and Valencienne, the baron’s not-so-innocent wife. Again, Pelzig goes straight up the middle here, having Lolo, Dodo, Jou-Jou, Frou-Frou, Clo-Clo and Margot pull all the genre’s boot-shaking, knicker-flashing and cartwheeling stops. What was nicely done throughout, and I don’t know if it’s Pelzig’s or Griffin’s hand, is how the singing characters slip into and out of composed motion. There are short bursts in Act One of full-cast unison gestures that dissolve without a hiccup into heterogenous milling about and pantomime—all the movement, choreographed or no, feels spontaneous and natural. Like I said, I can’t compare the Lyric to many other opera companies but this Merry Widow, unlike her husband, was full of life. I will be going back: Berlioz’ The Damnation of Faust, opening in late February with major video projection work by John Boesche (who created a stunning, growing moon for Widow), looks like it has a good chance of being amazing.